Bacon, eggs - and a ham. Not chips and beer like the summer evening at a provincial seminar some years back when a bunch of coaches sat around and waxed less than eloquently about development. It was an eclectic group that included NHL coaches and a smattering of junior, college and minor guys. Beer may have fuelled the conversation, but it did nothing to enhance it, let alone elevate it. I recall lots of rambling. Good chips though. But breakfast? Now there was a recipe that worked. The spray mentor thing (see last week’s blog) didn’t really cut it. So when an association brought me on to mentor its competitive team coaches, I needed to find a way to establish a baseline approach. We reserved monthly Saturday morning space at a local eatery. 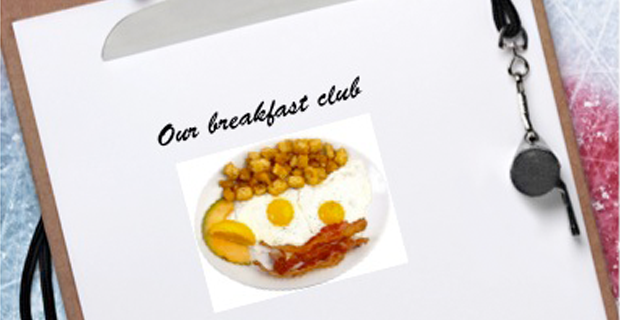 The association paid for breakfast. While it wasn’t compulsory for coaches to attend, it was most certainly an expectation that, barring a hockey or family conflict, this was part of their duties. Attendance therefore was a steady 75 to 90 percent and usually every team sent at least one from its staff. We’d discuss common issues and I’d regularly do presentations on teaching some component of the game, complete with handouts, drawing drills, and sharing with them how these ideas would best be implemented at their age groups. The association at the time had 14 teams. I’d created a development roadmap of skills and tactics to present at each level and coaches had to adhere to it, then build on these with their own ideas. The important link came when I went to practices to see if coaches were indeed using the plan and linking it to our breakfast discussions. To be clear, coaches were never told or sprayed with gems about how, for instance, a forecheck should be done. I borrowed a key narrative technique from my fiction writing days: show, don’t tell. Here, I’d say, are the pros and cons of getting bantam defencemen to pinch. Can your kids do this? Can you teach them how? Is it a necessary tool this year? For the most part, they followed the roadmap. I’d like to think our sharing of practice ideas and how to improve teaching techniques both made them better coaches and improved the lot of their teams. In fact, I worked with many of these same coaches some years later in another organization and it was neat to see that some had kept my handouts over the years and remembered the positive interactions of the mentorship gatherings. This is what mentorship was meant to be. Informal direction. Sharing ideas. Planting seeds. Asking questions. The program was a success and continues today under different leadership. Now whether or not they still have their bacon and eggs is another matter. If asked, I’d tell them coaches digest better with breakfast than with beer and chips.